Octopee Furrybones Purple and Pink Salt and Pepper Shakers [1387S] - $13.99 : Mystic Crypt, the most unique, hard to find items at ghoulishly great prices! Octopee Furrybones Purple and Pink Salt and Pepper Shakers. 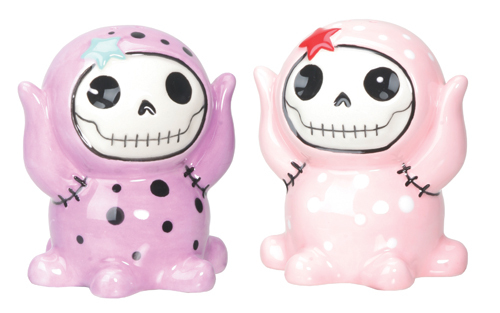 This awesome set of Furrybones salt and pepper shakers is the perfect addition to the table of any goth lover. Each of the glossy glazed shakers measures L: 2.5" X W: 2" X H: 3", with a clear plastic fill hole stopper on the bottom.